I have recently started to test all my breeding cats for the gene responsible for the Chocolate and Lilac colouration in the Ragdoll breed. Up until now, it has been believed that this gene has been 'lost' within the Ragdoll gene pool within the UK. In 2002, a breeding program was initiated to allow breeders to reintroduce the gene by outcrossing to Persians and Siamese. A few years ago, some breeders in the UK started to import Ragdolls into the UK which showed an outcross to the Balinese within their pedigrees. The Balinese outcrosses are highly controversial at the moment within the UK, with many breeders believing these cats should not have been registered as Ragdolls with the Governing Council for the Cat Fancy (GCCF), as the outcross was never allowable under the GCCF Ragdoll Registration Policy. I was very pleased to discover that three of my breeding cats, Chesawood Burlingtonbertie (Bert), Spiritdancers Minerva (Florence) and Magisragis Busbys Babe (Roxy) were all chocolate carriers. This has been proven by DNA testing. Bert and Florence are traditional Ragdolls with no known outcrosses in their lines and all lines trace back to Josephine, Daddy Warbucks, Buckwheat. With the exception of one line on Roxy's pedigree where the red gene was introduced via an unknown outcross, her pedigree is also traditional. I will be working closely with other breeders to try and secure the chocolate gene in the Ragdoll cat in the UK. This will be a very slow process. If you are looking for a Ragdoll kitten you may see adverts for 'rare' chocolate or lilac Ragdoll kittens. If you are considering purchasing a kitten that is described as chocolate or lilac do ask to see proof it is that colour via a DNA test. It is not always possible to tell via sight alone. Please be very carefull. Any kittens that I may sell as pets in the future that are registered and DNA tested as chocolate or lilac I will not charge a higher price for. All my pet kittens irrespective of colour, pattern or pedigree are the same price. 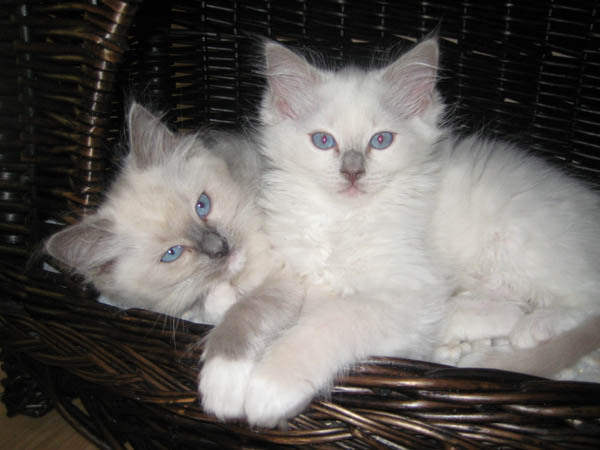 The photograph above shows two Ragdoll kittens. One is blue mitted and the other is lilac mitted. The boy on the right is lilac (Magisragis Chicharito), on the left blue (Magisragis Tom Kitten). Please note that the lilac mitted boy is DNA tested. For further information on chocolate and lilac Ragdolls please go to http://www.chocolate-lilac-ragdoll.co.uk/index.htm. This site has been set up by a group of Ragdoll breeders who will be working together to develop these two colours for the future good of the Ragdoll breed in the UK.